HITOSHI KASUYA 7th Dan W.S.K.F. Interview By Alistair Mitchell. Thoughts from Japan:'The Order of Things'.By Dave Hooper. HIDETAKA NISHIYAMA: Paris Seminar. Report By John Cheetham. KATA-NO-BUNKAI 'A Case of the Bland Leading the Blind'. By Mike Clarke. Champs-Course Reports. By J. Cheetham, A. G. Sanna, & P. Wiltshire. Source of Power in Karate Technique. By Avi Rokah. The DOJO KUN Explained. By Marilyn Pontuck. 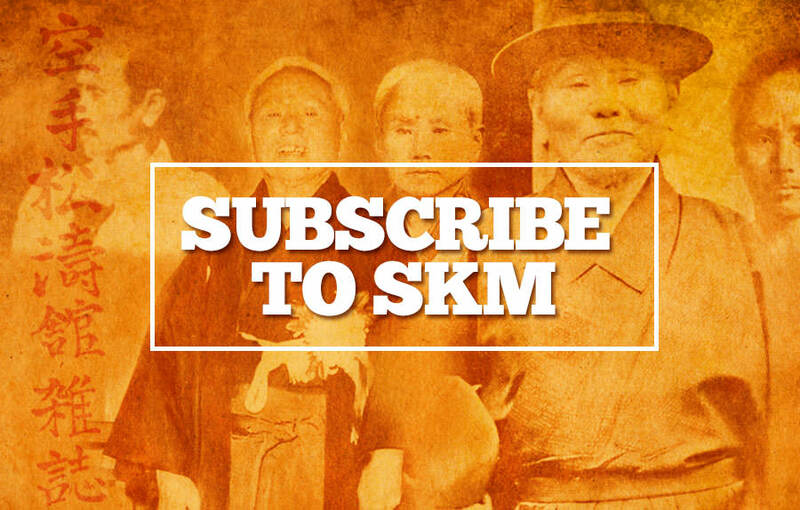 Welcome to the first issue of SKM for the year 2000 and I have to say how proud we (SKM) are, to be still going strong (in fact stronger than ever) after sixteen years of publishing this specialised magazine for Traditional Shotokan karate-ka. Shotokan karate has now been around for virtually eighty years, which is really quite amazing when you consider the various offshoot's that have come from karate. As Avi Rokah said in the last issue, there is such depth in our karate that it has no limitations which is why Shotokan is still going strong. I'm also proud to feature Nishiyama sensei, a living legend of Shotokan Karate-do. I've done a report on the recent seminar in Paris with Nishiyama sensei which was very educational and you can see the depth of knowledge that this master of Shotokan has to pass on. Of course karate must develop and move on, Nishiyama sensei is the first to agree with this, but the fundamental principles of the art never change and are a vital part of studying such a wonderful art as karate-do. Also never losing track of the fact that karate is still a 'martial art' and far more than just a sport. 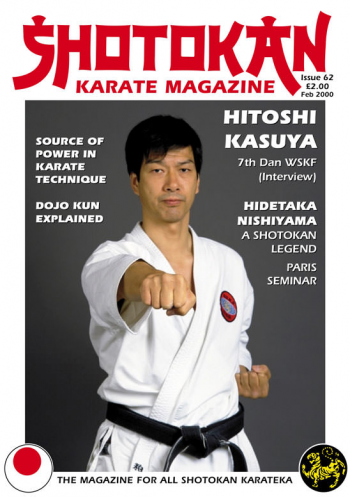 We have an excellent, informative interview with Sensei Hitoshi Kasuya 7th Dan, Chief Instructor WSKF (World Shotokan Karate-Do Federation). Kasuya sensei was a former member of the elite JKA kumite and kata teams with fellow instructors Yahara and Osaka. By complete contrast, Mike Clarke's article will raise a few eyebrows!! I have to say that I enjoyed his (very controversial) piece in this issue, even if I personally do not agree with many points he makes. I think our karate is far from 'bland'. But everyone has their own opinion! It makes life more interesting! Dave Hooper's article deals with the Japanese hierarchy system, kohai, sempai, sensei; a cultural difference which is so hard for westerners to comprehend and truly understand. We didn't have space for book or video reviews, however, 'The Shotokan Dictionary' is a 'must' if you want to know every possible Japanese term used in Shotokan; plus the equivalent Japanese kanji and photo's of the techniques in question. It's a mini bible for Shotokan karateka. The new Frank Brennan 'Highlights' video is simply 'dynamic' action from the golden boy of British Shotokan. I have very fond memories of his exceptional ability from my years as a member of the KUGB/JKA. I'm more than pleased to feature the first of a series of technical articles by Avi Rokah (Nishiyama sensei's assistant in Los Angeles). They will be an education! I thought with all the technical material in the magazine it would be nice to start the new millennium to balance all this with a philosophical article explaining the meaning of the Dojo Kun as laid down by the father of Shotokan Karate-Do, Master Gichin Funakoshi. This is a beautiful little article written by a sixty four year-old lady karateka from Canada; it's the best explanation I have read of Shotokan's code of ethics, which is far more important than just technique! Good training and good health for the new millennium. Editor.